HomeBreedsFrenchton: Is This Mischievous Dog Right For You? Are you looking for a French Bulldog with a little oomph? 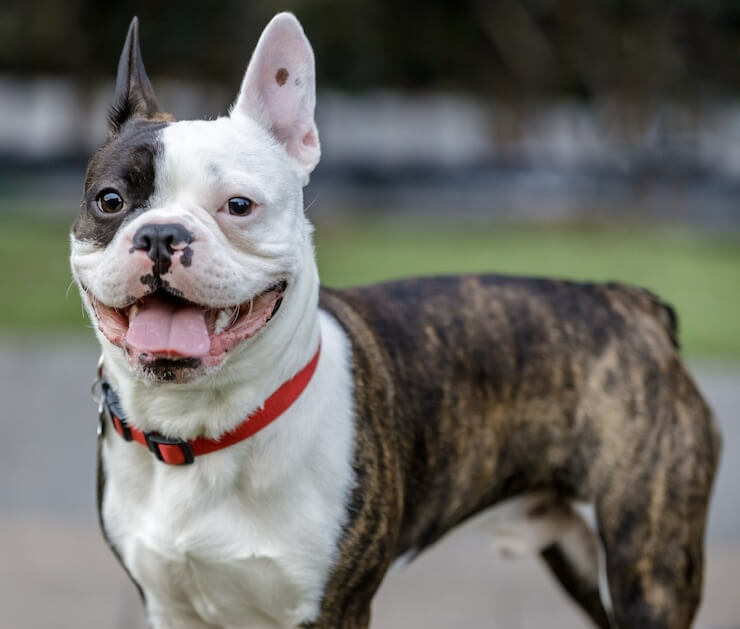 Then look no further than the Frenchton, a cross between the loving French Bulldog and the playful Boston Terrier, this mischievous dog will have you in stitches. This dog is suited to people from all walks of life, from seniors, singles, couples and families looking to gain a new canine member. This dog will do well in smaller spaces, making them a great match for apartment dwellers. 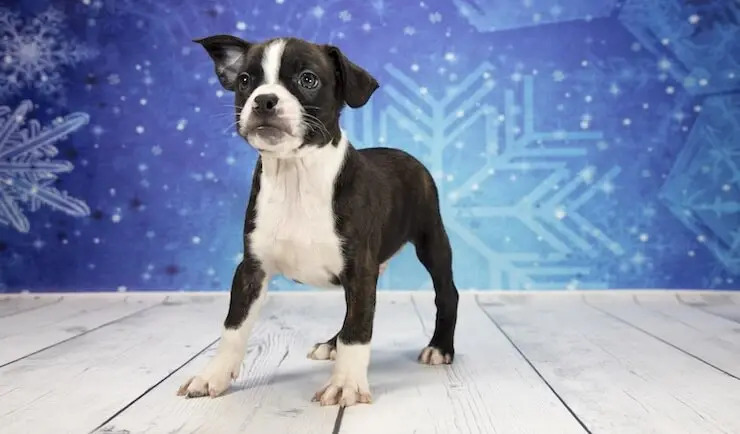 Is A Frenchton A Good Family Dog? How Much Does A Frenchton Puppy Cost? Some breeders breed exclusively F1 hybrids, i.e. a Boston Terrier cross French Bulldog. This results in a dog that is genetically a 50/50 split of both purebred parents. Other breeders produce F1B hybrids, which is French Bulldog crossed with a French Bulldog Boston Terrier mix. This results in a dog that is 75% Frenchie and 25% Boston Terrier, and is a much more common cross. This dog was bred to be a companion lapdog, and therefore they will easily become your best friend. First seen in the 1990s, they are relatively recent crossbreed but have been growing in popularity in the past 20 years. This pooch looks very similar in appearance to a French Bulldog; short in size and stocky in build with pointy ears and a flat face. 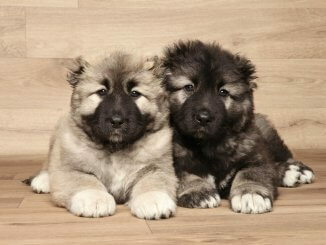 On average, these dogs are usually between 13 and 16 inches tall and weigh anywhere between 13 to 25 lb. If you wish to work out how heavy your dog is going to get, a good rule of thumb is to take the parents weights and add them together and divide by two. This can also be done with the parent’s heights to get an estimate for your pups height. No two mixed breed dogs are the same, and this is reflected in their coloring – take a look at the pictures on this article! This little dog can be: white, black, cream, fawn, black and white, and very rarely brindle. They can be one solid color, bi or tri color dogs. Like the French Bulldog, their coat is usually short and sleek. It is straight and soft to the touch. This mix is renowned as being fun loving dogs, who are known to be the centre of attention. Ever the entertainer, the Frenchton lives for human attention and love to make you laugh. However, they can be known to have quite a stubborn side and therefore you should be sure to look to train out any negative behaviours from a young age. 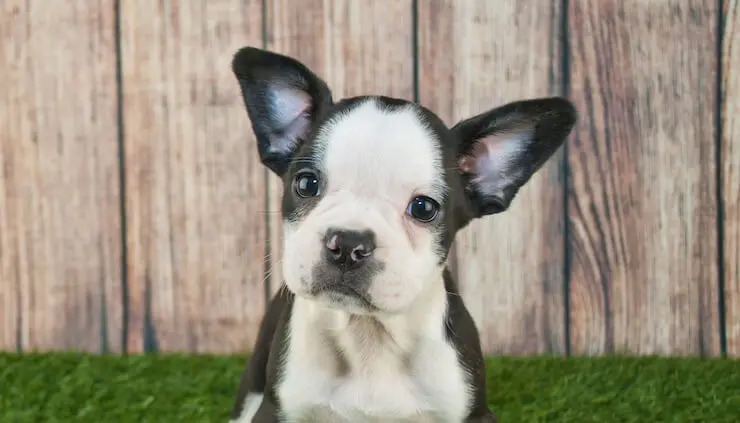 While the French Bulldog is not known to bark, Boston Terriers do, and therefore this may be reflected in your puppy. If your dog is barking, it may be due to their separation anxiety starting to kick in, as this is common in this breed. 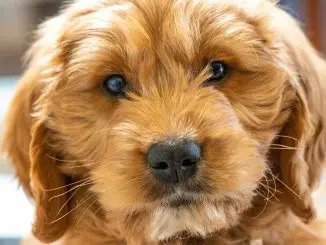 These mixed breeds, like most other dogs, thrive on attention and affection from their owner and may become quite distressed if you leave them for long periods of time – this may result in destructive behaviour during puppyhood such as chewing. Beyond the odd bark, they are relatively quiet beyond this, except for their snoring! These dogs are known to be incredibly loyal, staying by their owner or owner’s side through everything. They get on well with all people, but, will always love their owners the most. Females are especially known for their loving and protective nature when it comes to children, and as a result, they make wonderful family dogs, blending in seamlessly. This breed isn’t very understanding with other dogs, or household pets – who they are less familiar with. This initial nervousness may elicit a bad reaction from your dog, so early socialisation will be crucial. Whilst their bark is far worse than their bite, small dogs should be trained and socialized like any other dog. They are highly social dogs and love meeting new people – as a result they make wonderful family pets. However, despite their small size, they are known to be highly energetic and therefore any contact with young children should be supervised to avoid accidents. These dogs are of average intelligence, however, they love to please their owners. They enjoy training at a much slower pace. Therefore large amounts of repetition will be required over many short training sessions using plenty of praise, reward and positive reinforcement. If you are struggling, try a method like clicker training to promote positive learning and to reinforce the desired behavior. They thrive on positive interactions, as a result, any sort of punishment-based training or coercive methods can lead to confusion and behavioural issues when training. French Bulldogs are known to have a bit of a stubborn streak and this may carry through into this dog. If you are finding that your dog is being particularly stubborn – try using a better incentive. Good incentives will be whatever your dog values more: high value treats (e.g. chicken, steak or hot dogs) or high value toys (e.g. kong). Frenchtons are suited for people from all walks of life. This dog does very well with families, but, they also thrive with couples and seniors looking for a low-maintenance companion dog. Due to their low exercise requirements, they do not need a lot of space or outside yard, and can therefor easily thrive in apartments. This designer mix is primarily an indoor dog. Thirty minutes of exercise daily will be more than enough for these small dogs to get their recommended quota. These dogs do not need large amounts of vigorous exercise – so if you are not a huge fan of exercise yourself, this may be the dog for you. However, walking your dog is essential and helps to build a strong and healthy bond. Like French Bulldogs, he will not tolerate extreme weather conditions very well, therefore try not to exercise your dog in extreme heat or extreme cold. If it is a slightly chilly day, consider investing in a jumper for your dog. Likewise, if you do live in a hotter area and have your heart set on this dog, try walking late at night or early in the morning to avoid overheating. Frenchton puppies are active and love to play, make sure you don’t over exercise them during their puppyhood. Play is great for additional mental and physical stimulation, but, shouldn’t be used as a primary form of exercise. Like most Bulldog breeds, this dog loves tug of war and will be more than happy to play this game with you. French Bulldogs are very relaxed and tend to be indoor dwellers, so, if your mix takes after them, you may spend more time coaxing your dog to get outside for a walk. Boston Terriers enjoy lots of exercise, so if your pup takes after them, they will be at the door waiting for a walk. These dogs are very low maintenance dogs when it comes to grooming – they shed very rarely and require very little brushing as a result (a weekly brush should set your dog’s coat up nicely). When brushing your dog, opt for a softer brush or comb due to their thinner, lighter coat. Bathing should be limited to when they are dirty as over-bathing can aggravate their sensitive skin. As a result, perhaps try a medicated dog shampoo when bathing your dog. Due to their flatter face, they are prone to dental issues such as plaque and overcrowding. Tooth brushing should occur as regularly as your dog will allow, ideally 3 to 4 times per week. An annual visit to the dental hygienist is also recommended to remove any excess plaque. This dog breed should be fed about 20 to 25 calories per pound of body weight. This should be split into 2 to 3 meals daily to spread out their calorie intake. If you choose to feed dry food (i.e. kibble), you should feed ½ a cup of kibble two to three times daily. When choosing a dog food, be sure to check the nutrients listed on the packaging to be sure you are picking a high quality dog food with a high percentage of protein (over 20%). Due to recent changes to the way nutrient profiles are printed, it is now much easier to choose better quality food for your dog. Protein is essential for any dog. Be sure you are are feeding a high protein diet to your dog, this is vital for cell growth and generation, as well as keeping his coat glossy. For this breed, their diet should be between 18 % and 20% protein. This dog will do well on most diets types (e.g. dry, wet and raw) so it is important to do your research on the benefits of dry, wet and raw diets and pick the diet that is most appropriate for both you and your dog. 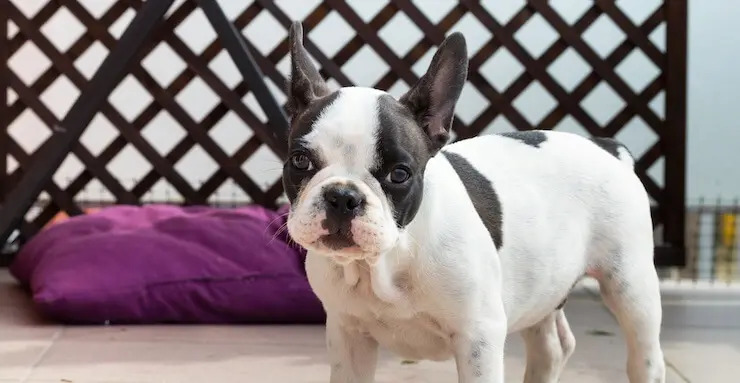 These pooches are known to be relatively happy and healthy dogs who live long lives, however, they do have some health issues related due to their brachycephalic classification which potential owners should be aware of. 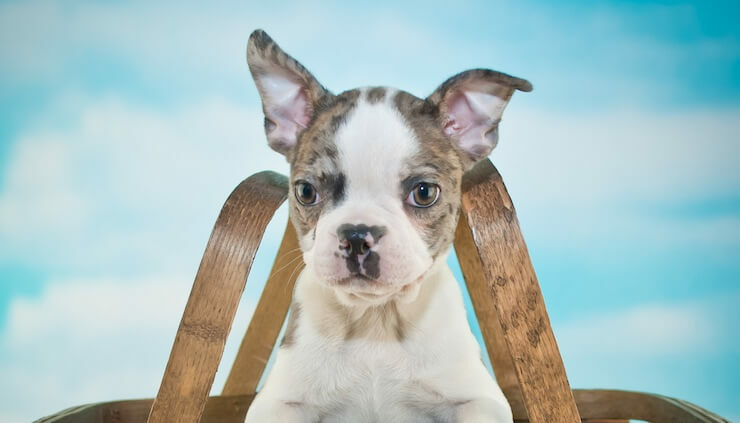 Both the Boston Terrier and French Bulldog are brachycephalic dogs, meaning they have flatter faces. This can lead to health complications such as an inability to breathe without hinderance. You will know if your dog is having issues with their breathing as they will pant regularly and wheeze when they breathe. These dogs also struggle to regulate their temperature – another side effect of their flatter face. So this pooch is not suited to areas that are regularly very hot or very cold (they are best suited to areas with a moderate climate). Another result of a brachycephalic skull is large, bulging eyes that are left unprotected leaving them susceptible to infection and injury so these dogs are also prone to eye diseases and issues like cataracts. Skin conditions are another health concern, this is as they have large folds of skin, consequently resulting in conditions like eczema and dermatitis. Finally, they suffer from a condition called Achondroplasia – which is a type of dwarfism. 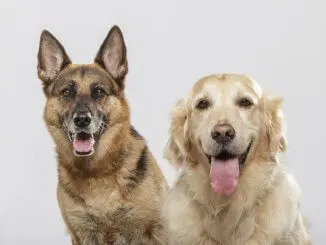 As a result of this condition, the dog’s bone do not grow to their expected size and forms shorter legs in comparison to the rest of their body. What Is The Typical Frenchton Lifespan? These dogs usually live between 12 and 15 years – a few years longer than their French Bulldog parent. This being said, as long as they are exercised regularly, and eat a healthy diet, they may live longer than 15 years of age. When trying to purchase this, is important to make sure you find a reputable breeder. Due to high prices and low availability, some potential owners will look to adopt instead of purchasing. Specialist charities such as French Bulldog Rescue do re-home crossbreeds like this, or you may be able to find one in your local rescue centre. These dogs can be quite hard to locate as they are not particularly common. As a result, puppies can sell for anywhere between $900 and $2,500 USD. In addition, F1Bs can be very expensive as female Frenchtons can’t mate due to the shape of their body – so they need artificial insemination. As well as this, they cannot give birth naturally and consequently need surgery, such as a caesarean section which is expensive and increases the cost of puppies. If you’re looking for a low maintenance dog that loves meeting new people and adventuring to new places, but, is just as happy curled up at home on the couch, then this pooch is ideal. Frenchtons require very little specialist care, and therefore have low grooming, feeding and exercise needs. However, they have a very high attention requirement and can get destructive if this is not met. Therefore, if you are away from the house for extended periods this may not be the dog for you. These dogs are an investment, as not only are they expensive to purchase, they also have a long list of potential health problems.